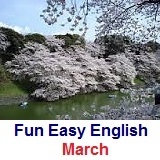 ﻿ Fun Easy English - new classroom free online classes english language lessons speaking listening writing reading march. Grammar this month focuses on nouns and pronouns. Pronunciation lessons continue with vowels. Learn a few new reductions. March 2 Grammar: aspect Pets Are Family, Too! 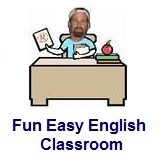 March 5 Grammar: non-countable nouns Run! Bees! March 6 Slang: letter C Save the Bees! March 9 Reductions: oughta Find Your Joy! March 17 Reductions: gimme I Feel Super! March 5 - Mardi Gras - Test your reading comprehension about Mardi Gras. March 10 - Daylight Saving Time - Test your reading comprehension about Daylight Saving Time. March 17 - St. Patrick's Day - Test your reading comprehension about St. Patrick's Day. March 20 - Spring Equinox - Test your reading comprehension about March Equinox. March 22 - World Water Day - Test your reading comprehension about World Water Day.